I was contacted a few months back about the possibility of going Solar, by a company that is based down in Malibu, California (not too far from me). I have looked into solar previously and the cost just did not allow me to follow through on it. But there have been advances in technology etc and I am always interested in such things. so when the salesman asked me to setup an appointment I did, simply thinking that I would find out more information, but telling them straight that I did not expect to sign up. The next week I had a nice chap called Mark Raymond(818 455 1487) turn up on my door on time. He was very pleasant and I have to say that maybe I was curious, but also a little stern. There was no way a salesman was going to come into MY house and sell me something I possibly could not afford. I really felt that I was ready for this confrontational meeting. I expected it to be such , as he would be busy trying hard to sell me something, and me parsing through what he says to pick out the facts and figures that I know would show me it is not yet viable. However the conversation soon showed that I may have been wrong. It appears that maybe there is actually a chance that this was worth signing up for.. Oh my goodness, all my pre-conceived ideas were going awry. Well I asked a LOT of questions, I had also done some homework and found lots of awkward questions to ask ( I love putting salesman in awkward positions :). So I asked each one, I was honest and also a bit brusk I am sure as i brushed aside several 'facts' that he had. Taking some number even with a large pinch of salt still made this whole thing look interesting. As it went on I found myself searching for more questions to ask to make this deal unviable. However I was running out of them fast. In fact I told Mark to setup the next stage in the process, as his numbers showed me I could actually save money very soon with the Solar installation. It all comes down to me paying a lease, and ALSO paying California Edison each month. How can this be good? Well simply put the lease cost is dependant on the size of your installation. The amount of electricity the installation generates is relative to the size of the installation and the sunlight it gets (shadowed gets less etc). So the amount of electricity you generate means you do not have to pay Edison. Therefore we add the cost of both sides and you get your monthly payment amount. for me it was rather close to what I am currently paying (on average for the year). BUT.. There is a kicker... Edison put up their rates each year. My lease cost will not change for the next 20 years. So it causes the cost of my electricity to stay pretty much the same for the next 20 years (the part I still don't generate has to be paid to Edison, so that will go up). Unlike if i am totally Edison and the cost goes up so 6% or so a year (though currently it is slated for 9% for the next 3 years). Maybe I need to point out 'Tiers', and these effect your bill each month to a huge extent. Tier 1 electricity from Edison is much cheaper than Tier 2 and so on. I barely get into Tier 4 for my own electricity, but I am sure if you are in Tier 4 or even a higher tier, then there should be possibly more to save. There are several stages to getting Solar put in (or there are with American Solar Direct), and so Mark left my house with some information and we were going to meet again after they had crunched more numbers and made sure my roof was viable. Several people have asked how the older games from Midway 1 and Midway 2 work out for popularity. So I asked and received the list below. No real surprises as in Midway2 'Swingers' is number 1, I am told by a large margin. this is no surprise because it has that special exclusive perfection prize. Well worth playing for. In Midway 1 it is no surprise to me to see 'Ball Sqeezer' at the bottom of the list, as people tend to find this one very difficult (though I personally think Bell Ringer is harder). Hope you al find this information interesting. Though once again I cannot understand some of the games positions. Now some of this order may surprise you (it does me). So after the list I will post a few thoughts on why the order is like it is. So whats surprises you? For me there are several, not least the most played game being 'Beans beans beans'. Also I would add that the least favourite game is 'Whack off', which I thougth was pretty fun, but is bottom. I was expecting something like Penny pincher to be top, as it has that Special Exclusive prize that people play for, and it was indeed close. I think Beans beans beans is top as it is just so fast a game to play. I think the fastest out of all the game in the Midways to be honest. Therefore I think people can throw away a game very quickly and so just simply have another. Also with it being so fast, freeplay frenzys on that game will allow a larger number of players to participate than a slower game like 'Whack off'. Any thoughts on why the games are popular in this order? For quite a number of years now I have wanted to be completely mobile with my programming. I want to do this for many reasons, but the one that most excited me is the chance to go on vacation in the summer months when my kids are off school, and yet be able to work. Therefore extending my summer vacation time (sort of), and allowing us to travel through more of this wonderful country. Only I have not really managed to get there yet. Although I always feel I am close. I have my computer at home in the spare bedroom, the one that is reserved for visiting friends and family. When not in use by those people it doubles as my computer room and creative den. Well several months back my Mom came to stay with us for a month and it was great. During that time I move my desktop computer into a makeshift area in my living room. And as you may guess it is stil there 3 months after she has gone back to blighty. Well my excuse was that another member of my family was gonna come out in september. Only that has been delayed a month or two now. So why not just move back into the spare room? Well it feels like too much trouble, adn IF this is too much trouble, how the heck do I call myself portable? GAH! It galls me to realise that I am really so far away from my portable manouverable dream. Now I need to work on that. I am sure there will be more to this story (soon i hope). How do you do your research when designing for new game menus on devices? Me personally I write down all the things I would like on a particular menu screen, and then I go to check what others have done and refine my basic layout/design with what I like and dislike from my trials. However I have choices in which other apps and games I can investigate. Do I check out the most popular games, thinking that being most popular means they must have done the best job... right??? Only.. Well I do not personally believe that in of itself. Still I also have the option of checking out the games I already own. This is the option I tend to go for. In fact i refine my list even more to the games I have enjoyed myself. This has the benefit that the games I want to check out I don't have to go find and download, it also tends to mean that I already know which games have menus that do something similar to my needs. Once I have played with several other apps menu pages, I finish out my own and hopefully make them feel not just better than if I had not done the research, but also I hope to improve on the designs I liked most in other games. This gives me a lot of confidence in my New menu designs. I am going Solar electricity at my house. They will place 13 panels on my flat garage roof in the next month or so, then months later the council and utilities company will allow them to turn it on. As a signing bonus they have given me a nice shiny and new iPad 2. 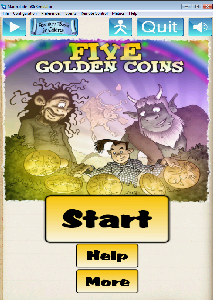 Now I have an iPad 2, and last night rather late I put on the new version of '5 Golden Coins' and Wow... The display is amazing. Now my graphics are tailored to just under the ipads resolution, so I get a small amount of stretching, though you really cannot tell. Instead what you see is this gorgeous display, so clear and detailed. I am astounded. After using the kindle now for 10 months, I am shocked to see how much better this iPad display looks. I know I shouldn't.. but wowza! In fact I am so happy with the way it looks, I will be showing off my app on that device in future! Not sure yet if it will end up being my default development device or not. The kindle is pretty darned handy for that. As well as the fact it fits in my jeans pocket! Posted by VoodooChief at 8:53 AM 0 comments iPad 2, nice display! 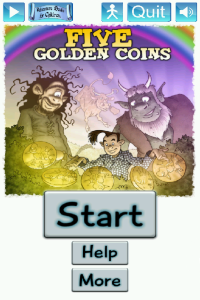 I have been working on improving the overall look of the '5 Golden Coins' Book App. One of the improvements on my list was to improve the way the buttons looked. I had some good tuition from one of my workmates (an artist obviously), and on sunday i mae what i envisaged, Woohoo! Do ya like my new butons, they match the coloration of the logo now. They are also less boring and staid than the original grey ones i had intially implemented. Also in the second picture you can just about see the rainbow waterfall effect over the logo and raindbow in the title image. Finally you can see from this image the new backdrop i am using, and it is a picture of a slightly aged page. This adds more to the fading than anything else though. still a nice subtle improvement. Once i get this new version setup properly on an ipad (or 4:3 aspect ratio) I will be ready to resubmit. I'd bet that you have said that line to several people already in ya life. They were looking blankly at say the monitor of their desktop and wondering what buton to press first, or maybe what way up the keyboard should go! Still you knew what they wanted to do was Soooo Easy. Then ya showed them and they were astonished at how hard or complicated it still was. Learned knowledge is a powerful thing. However, until we get this mythical person to show us how to use this GDK, we will keep fumbling in the dark. At times it is a frustrating process, yet.. I have hope and a desire to see us gain the knowledge to make this all work. With mine and the teams desire I know we will succeed. Even if it feels Like i am bamnging my head against this wall of unfathomable code. Strength of will and purpose will see us through. I recently applied to get into Marmalade's App program. Something I also did with my previous Hot Chicks the card game title. They didn't want Hot Chicks, which was no real surprise, being that it is controversial to some degree. However I hoped for a lot better with my first in a series of Book Apps. Not that I was breaking any ground in visual effects or 3D or anything else that would show off their wonderful SDK in any way. Still I figured as I am the only person creating this type of interactive book, I stood a chance from an original gameplay perspective. Well last Friday I was rejected. In a really nice way I might add. The nice fellow who is my interface was very kind and has asked for some enhancements to the App itself, and he would love to see it again. He mentioned he loved the idea, especially if it can be a cross promoting series of Book Apps (which is my aim). He suggested a few simple things that would enhance the game.While I have made a nice list of things that I would like to do and in some cases would NOT like to do, to improve the look of the game. Notice how above I mentioned LOOK of the game? This is really what I am doing at the moment. I am not necessarily improving my Game/App. In fact all i am doing is dressing it up with more 'Bling' as a friend Andy said yesterday. At first I was a bit frustrated at the thought of altering the most simple UI layout I have ever created (this is for young children after all). Then on reflection and playing the App on my Kindle Fire as objectively as I could. I realise that I went too far. I did not create all that bling for several reasons. But now I feel I should have some. The title page for example has no animation on it, and I HATE dead title pages. So that one was easy to feel good about changing. Now I could list all my current blingification items, but i'll leave that for now. What matters is the reasons to add in all this bling. Perception is the reason, and first impressions counting. If someone sees my bland title page, they perceive a value for the App. Regardless of the game beneath. Now they will see a much more vibrant title page, making it more inviting imho. So I am taking a lot of time to add bling to my app not just so it will have another chance at being in the Apps program, but also so peoples first impressions are of a higher value App. I can and will alter peoples perceptions of the 5 Golden Coins app, in a positive way! Worth the time... You betcha! Sony have announced several winners and the prizes they have won. You can view this information inside Playstation Home on the Prize boards in the Hot Zone. These prizes were won by entering the sweepstakes. Each green ticket you spend in the Hot Zone or in the Midways will earn you an entry into the weekly drawing. Also you will entered into the final Grand Prize Drawing for the $15,000 prize! WOOHOO! And the green tickets are only $1 for 50 tickets, so it is really cheap to enter as well. So get into Sony Playstation Home (Free and on your Playstation 3) and have a Blast winning a ridiculous amount of Avatar gear and furniture items for your Free personal space (awarded when you enter one of the Midways). Note: I work professionally for Mass Media Games and have worked on creating some of this content for Playstation Home. 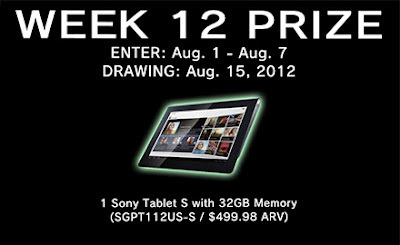 Posted by VoodooChief at 12:13 PM 0 comments Midway Sweepstakes Winners! So I was busy last night. I was also quite strict with myself and only did about 15 minutes of programming and I was happy, because I proved to myself that what I wanted to do was gonna be fairly easy and pretty fast. Then in a rare show of mental fortitude I left the coding.. and turned off my PC. I know, ya thinking HOW do I do the design work while my PC is turned off, and also ho at lunchtime while out. I'll bet ya even thinking I am using a Laptop, but I am not. In fact... I am using an age old technique I have used for more than 30 years designing games. Shocking isn't it. Of course this does mean that all the stuff I have written so far will need to be typed in at some point. But I have a secret weapon that is my wife, and she types ten to the dozen i can tell ya. So no worries from me on that one. I also use paper as i tend to do a lot of simple drawings to flesh out what I am writing about. Those I sometimes scan in. This is currently what I have for me code. Once agai using CombatEva and a very odd forward shuffling motion. In this picture I am showing our Hero moving forwards (except i cannot see any movement, cos i have no visual queues at the moment (SCOTT! ), that was a shout out to my artist :). He is moving across the screen and the camera is following. Except in reality I will conveyor everthing to him instead of him moving forwards. That ball ya see on the floor is CombatEvas head texture on a ball that Scott made for me. It sort of rolls around at the moment and is boring. Though Eva looks like she is about to drill it with a big footy kick, yeah! So the game obviously will have a bit of side on action, though it will also have otehr angles to play with. well that's all for tonight. I am gonna write something else in the design now. Cos i am too excited to go to bed and sleep (Me and me mate are going Off roading on our off road bikes tomorrow, Yeah Baby!! ).